Iraq War – Page 2 – Fix Bayonets! 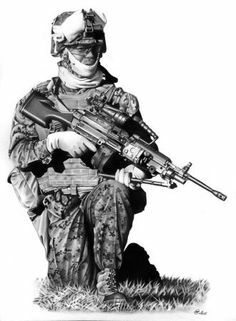 The First Marine Division is the ground combat element of the I Marine Expeditionary Force; the same division that had fought on Guadalcanal, at Khe Sanh, and in the retaking of Kuwait. In 2003, the 1stMarDiv was assigned to participate in the invasion of Iraq and the taking of its capital city, Baghdad. The March Up (to Baghdad) would take these Marines 740 miles across a hot and dangerous desert —they would do it in record time. Speed, as one expert noted, was the division’s best tool in overwhelming the enemy. Telling the story of The March Up: Taking Baghdad with the United States Marines are two contract writers who had unprecedented access to Marines and their commanders —both of whom are retired Marines: Colonel Bing West and Major General Ray L. Smith. Francis J. “Bing” West served as an infantry officer during the Vietnam War, first as the platoon leader of a mortar platoon, 2nd Battalion, 9th Marines, later with a Combined Action Platoon that fought for 485 days in a remote village, and also as a member of the Marine Corps reconnaissance team that initiated “Operation Stingray”: initiating small unit attacks behind enemy lines. Colonel West also served as Under Secretary of Defense (International Security) in the Reagan Administration. He has been to Iraq and Afghanistan numerous times and has written nine books about his experiences as a US Marine. General Smith also served in Vietnam, and since then commanded infantry units at all levels. 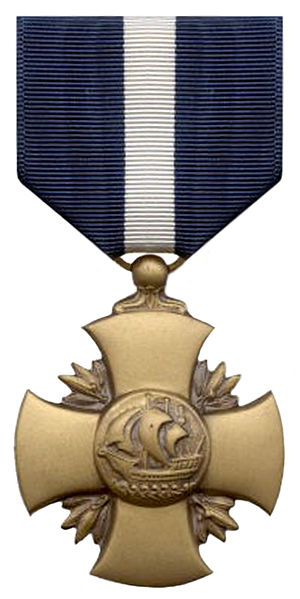 He is entitled to wear the Navy Cross, Silver Star (2 awards), Bronze Star, and Purple Heart Medal (3 awards). While on active duty, General Smith served as Executive Officer 2nd Battalion, 8th Marines, Deputy Commander, Marine Corps Base, Japan, and Commanding General, 3rd Marine Division. The March Up takes the reader directly to front line action as the Marines, under the leadership of a man West describes as a werewolf on the battlefield, (then) Major General James A. Mattis, attempts to achieve their objectives before the Iraqi Army can organize a cogent defense. West and Smith use the Army command’s order to halt in place for resupply as a primary example of the cultural differences between the two services. General Mattis didn’t have time for stacking BBs; what he needed in terms of logistics support, he carried with him. The sixty or so years of combined military experience enable authors West and Smith to understand the strategy and tactics of the Marine advance. They tell us what went right, and what went wrong. No other journalists had such unfettered access to infantry leaders; no one else had the mobility to cover the entire battle area. No other writers had as sophisticated an understanding of what was unfolding before them. Throughout the march to Baghdad, West and Smith observed eighteen separate combat units in the 1stMarDiv, and this enabled them to capture a dramatic and personal account of how the Marines fought this battle. They also tell us of the unspeakable cruelty of war. Struggling to cross the Diyala River, the Marines find their first significant opposition. The number of bridges is limited; the Marines need pontoon crossings to help propel them forward. Searching for type equipment, the Marines encounter an Iraqi tanker truck and fire upon it, killing its operators, only to discover later that the Iraqi men were unarmed. The authors want us to understand that senseless tragedies are all too common in war; what happened there is emblematic of what is meant by the term, “fog of war.” Combat troops don’t know what they don’t know —but their lives depend on making snap decisions. The March Up is about war, and death: the death of the enemy and the innocent. It is about death by lethal fire, and death by accident. How do our warriors deal with this day after day? How do Marines deal with the killing of carloads of civilians, who in their enthusiasm to get out of the way of clashing forces, race their family sedan toward Marines barricades, forcing the Marines to “open up” on them? Knowing what happened today, how do our Marines prepare themselves for the next day’s operations? 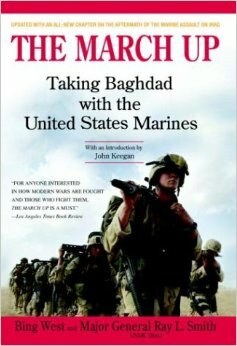 The March Up: Taking Baghdad with the United States Marines —only $11.00 on Kindle, or free in your local library. The Marine later recounted of Fallujah, “Man … when you drove past that place, you didn’t even want to look at it. You could feel the presence of evil in there.” In November 2005, 3rd Battalion, 5th Marines (3/5) joined thousands of other coalition forces in an attack upon Fallujah. They called it Operation Phantom Fury and it was the largest combined assault since the invasion of Iraq. The attack was preceeded by warplanes attempting to pouund the city into submission, and then in a driving rain, the Marines moved in. At the time, Corporal Jeremiah Workman was serving as a squad leader in a mortar platoon. For 17 days, Marines hunkered in the mud at the northwest corner of the city lobing shells at the positions of enemy insurgents. There was nothing personal to this, Workman recalled. It was a fire mission; Marines carry out their assigned mission. The next morning, Workman was assigned to command ten Marines and they took the right side of the street, while Sergeant Jarrett Kraft commanded the Marines on the other side of the street. It didn’t take long before the Marines were finding weapons and ammunition, seized it, and placed it in a HUMVEE that followed along. When the Marines entered the third house, Workman heard the sound of machinegun fire from across the street. Sergeant Kraft had discovered a group of heavily armed insurgents. They had found the evil. Workman remembered being scared for two long seconds. “It was a man check,” he said, “but I’m a corporal in the Marine Corps, and my Marines are looking for leadership.” So he led his Marines toward the sound of the guns. “Those Marines are dead, Workman … now clear out,” the corpsman shouted back. Workman ran back to the house, which was now in total darkness and the air clogged with smoke. Leading a third charge up the stairs, Workman encountered a second grenade and the explosion knocked almost everyone down. Workman pulled out a grenade of his own and tossed it into the room where the insurgents remained barracaded and just then, the company commander grabbed Workman by the helmet and pulled him out of the house. An M-1A1 tank had arrived. Vengence is mine, sayeth the Lord. For extraordinary heroism while serving as Squad Leader, Mortar Platoon, Weapons Company, 3d Battalion, 5th Marine Regiment, Regimental Combat Team 1, 1st Marine Division, U.S. Marine Corps Forces, Central Command in support of Operation IRAQI FREEDOM on 23 December 2004. During clearing operations in Al Fallujah, Iraq, Corporal Workman displayed exceptional situational awareness while organizing his squad to enter a building to retrieve isolated Marines inside. Despite heavy resistance from enemy automatic weapons fire, and a barrage of grenades, Corporal Workman fearlessly exposed himself and laid down a base of fire that allowed the isolated Marines to escape. Outside the house, he rallied the rescued Marines and directed fire onto insurgent positions as he aided wounded Marines in a neighboring yard. After seeing these Marines to safety, he led another assault force into the building to eliminate insurgents and extract more Marines. Corporal Workman again exposed himself to enemy fire while providing cover fire for the team when an enemy grenade exploded directly in front of him causing shrapnel wounds to his arms and legs. Corporal Workman continued to provide intense fire long enough to recover additional wounded Marines and extract them from the besieged building. Although injured, he led a third assault into the building, rallying his team one last time to extract isolated Marines before M1A1 tanks arrived to support the battle. Throughout this fight, Corporal Workman’s heroic actions contributed to the elimination of 24 insurgents. By his bold leadership, wise judgment, and complete dedication to duty, Corporal Workman reflected great credit upon himself and upheld the highest traditions of the Marine Corps and the United States Naval Service. “The thing is, helicopters are different from planes. An airplane by its nature wants to fly and if not interfered with too strongly by unusual events or by a deliberately incompetent pilot, it will fly. “A helicopter does not want to fly. It is maintained in the air by a variety of forces and controls, working in opposition to each other; and if there is any disturbance in the delicate balance, the helicopter stops flying immediately and disastrously. There is no such thing as a gliding helicopter. “This is why being a helicopter pilot is so different from being an airplane pilot; and why, in generality, airplane pilots are open, clear-eyed, buoyant extroverts and helicopter pilots are brooders, introspective anticipators of trouble. What Mr. Reasoner said is absolutely true. Piloting a helicopter takes a skill set few on this earth are capable of, but it takes even more than that to pilot it under harsh conditions. Equally difficult was the entire process of adapting this ungainly aircraft to sophisticated military operations, but the military’s success in achieving this seems apparent by the number of our warrior’s lives saved by skillfully flown helicopters, from resupplying them with much needed munitions in order to continue the fight, to evacuating our wounded to field hospitals. No matter what mission our helicopter pilots undertake, it is exceedingly dangerous work. The Marines took possession of its first two helicopters on 9 February 1948. The Sikorsky HO3S was a fragile airframe with significantly limited performance parameters, but it was a start. When the Korean War broke out, Marines were scrambling to put together a provisional brigade to help shore up Army units in Korea pushed all the way south to the end of the peninsula —the Pusan Perimeter. Until the arrival of the Marines, led by Brigadier General Edward A. Craig, the Korean issue was in doubt. General Craig took with him a seriously understrength regiment, but also a Marine Air Group consisting of three fighter squadrons and one observation squadron, VMO-6. The observation squadron operated eight fixed-wing light aircraft and four HOS3-1 helicopters. 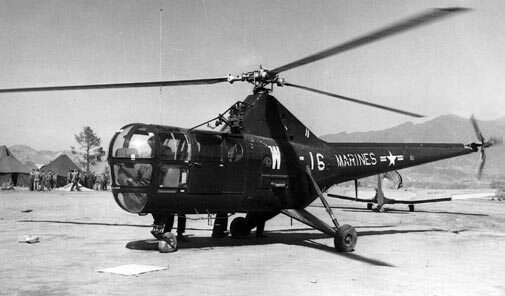 Nevertheless, the early helicopters were somewhat limited in their lift capability, an important lesson for Marines because of the battle of the Changjin (Chosin) Reservoir. In the frigid conditions of North Korea, early helicopters barely achieved 5,000 feet in altitude in an area where mountains reached from between 4,600 and 6,000 feet in above sea level. In 1948, the Marines hoped to activate two assault/transport helicopter squadrons by 1954, but the Korean War accelerated this timetable by a wide margin. The Marines settled on the HOS4, an airframe severally designated for service with the Navy-Marine Corps-Coast Guard, and the Army-Air Force. 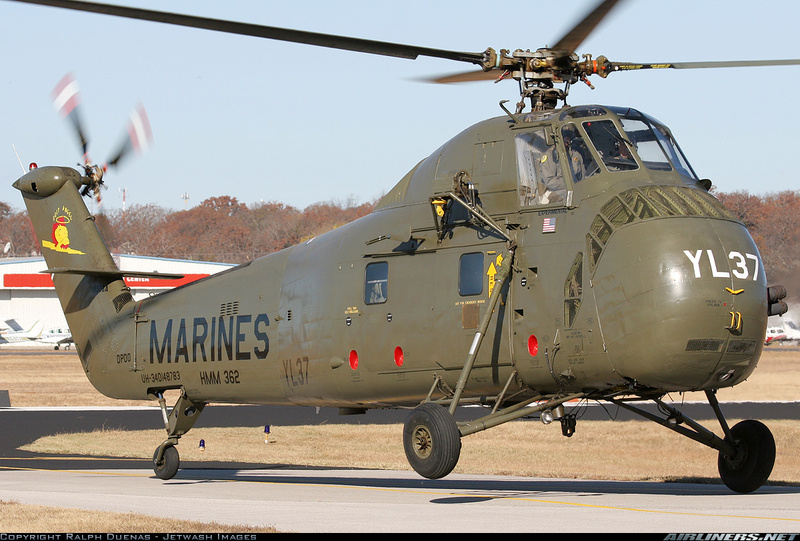 Used by both the Army and Marine Corps in the Korean War, the Marines called their version of this helicopter the HRS-1. Over the next ten years, US politicians shifted their attentions from Korea to a place hardly anyone had ever heard of: Vietnam. What was evolving there was quite complex. The French, badly defeated by the North Vietnamese forces in 1954, were going home—a fact that left the Republic of South Vietnam with a weak military posture. To help shore up the South Vietnamese defense establishment, the United States began to send mentors to help train, organize, and advise the South Vietnamese military leadership. A small number of Marines participated in joint staff, communications, and advisory roles—particularly those advising the emerging Vietnamese Marines (RVMC). As part of the military assistance mission to South Vietnam, the United States provided Army aviation companies (helicopter). In late 1961, the Army operated two companies equipped with the Piasecki H-21 tandem rotor aircraft. While capable of transporting ten fully equipped assault troops and crew, the H-21 proved only marginally suited to service in a high humidity environment, and only slightly suitable for night operations. By the end of 1961, General Paul D. Harkins (Commanding MAAG, Vietnam) realized that he needed additional helicopter assets; he requested two additional aviation companies. While the JCS approved a third aviation company, for Vietnam, the JCS indicated some reservations about continued use of the H-21. They directed the Commander in Chief, Pacific to review total requirements for helicopter operations in Vietnam. Admiral Felt made two recommendations: first, that the JCS approve a fourth aviation company for Vietnam, and second, the assignment of Marine helicopter pilots to augment Army aviation companies. The problem with Admiral Felt’s recommendation was that Marine Corps pilots were not familiar with the operation of the H-21 tandem rotor helicopter, nor were Marine pilots sufficiently familiar with the Army’s aviation standardization procedures. In the meantime, an additional aviation company in Oklahoma received a warning order to begin preparing for deployment to South Vietnam. General Harkins, having assigned the 93rd Aviation Company to Da Nang, requested cancellation of the fourth aviation company and instead asked for a Marine Corps helicopter squadron for operations within the Mekong Delta. “When the tempo of operations permit, the Marine Corps squadron will be relocated to I Corps and the 93rd Company to III Corps,” Harkins said. Rapid deployment is what Marines do for a living, so it was no surprise to learn that there were two squadrons available to General Harkins within a very short time. The first was HMM 362 (Marine Medium Helicopter Squadron 362). HMM-362 had been part of the Special Landing Force (SLF) aboard the USS Princeton (LPH-5) patrolling the South China Sea. HMM-261 was also available, but ordered to an emergency deployment in Thailand. HMM-362 became the lead element of OPERATION SHUFLY, arriving at Soc Trang, south of the city of Saigon, for operations in the Mekong Delta on 15 April 1962. 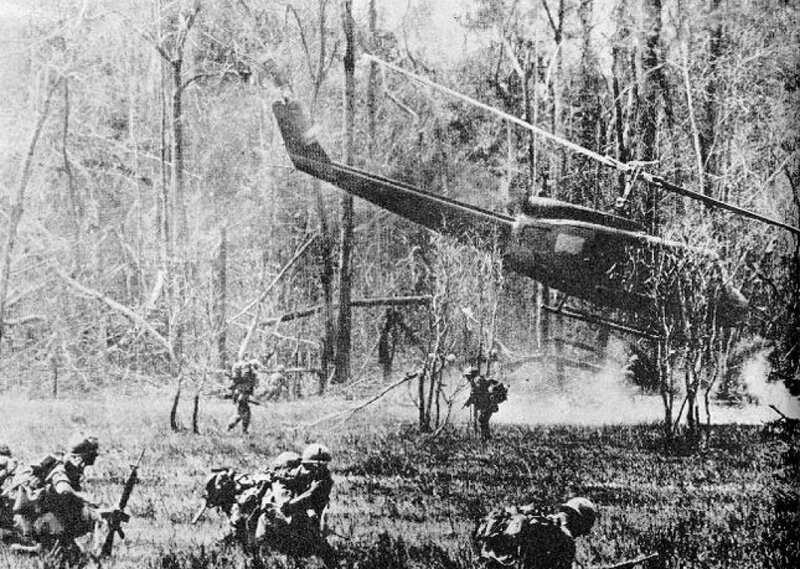 The squadron lifted their first troops into battle on 22 April 1962 —the first Marine Corps combat unit to serve in Vietnam. Before their re-designation in 1969, HMM-362 participated in operations at Ky Ha, Marble Mountain, Hue, and Phu Bai. They also supported operations from the sea while serving aboard the USS Iwo Jima (LPH-2), USS Okinawa (LPH-3), and USS Princeton (CV-37/LPH-5). 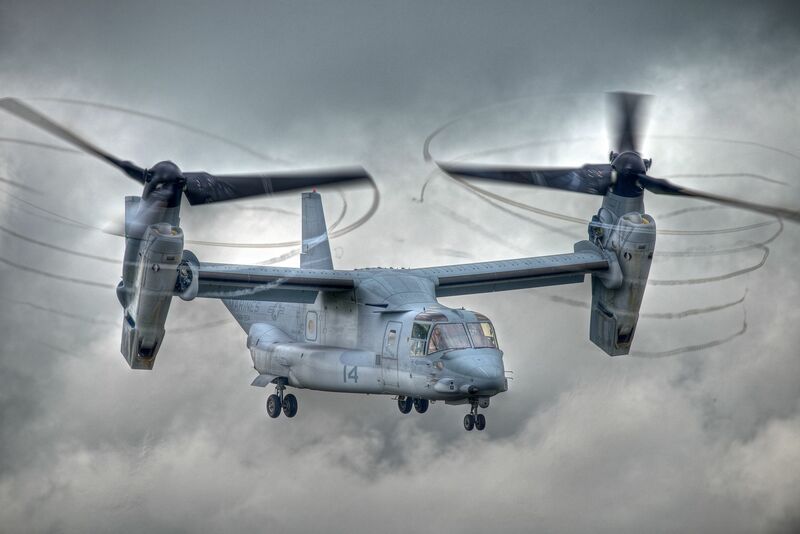 If Mr. Reasoner thought helicopters were different sixty-six years ago, then they have become more so since 2005 when the Marine Corps accepted their first V-22 Osprey. The first two squadrons of this type of aircraft were designated Marine Medium Tilt-rotor Squadron (VMM)-263 and VMM-266. Frank Piasecki (1918-2008) was an aeronautical engineer and the man that pioneered tandem rotor helicopter designs and developed the concept of vectored thrust through the use of a ducted propeller. HMM-362 would later receive the CH 53 helicopter and the new designation HMH. They called themselves the Ugly Angels. These are noteworthy sentiments. We would expect to receive such advice from our father or grandfather, particularly if either had served in the military during time of war. But these are the thoughts of a 30-something officer who became known throughout the Marine Corps as the Lion of Fallujah. He was speaking to his Marines while in command of Company E, 2nd Battalion, 1st Marines. Fallujah was a troubling location from the outset of the US invasion of Iraq in 2003. The community was a beneficiary of the economic policies of Saddam Hussein, there was hardly any unemployment in the city, but none of the people living in Fallujah seemed to be particularly loyal to Hussein, either. It was a traditional and very religious community. US Army units entered the city in April 2003 and almost immediately, things started going downhill insofar as good relations with the inhabitants was concerned. Between 23 April and 28 April, 17 Iraqis were killed and 70 more injured when shooting erupted between US soldiers and protesting locals. Each side claimed that the other started the shooting. Three more deaths resulted from an incident near the Ba’ath Party headquarters. The 3rd Armored Cavalry Regiment replaced the 82nd Airborne troops in June and they too came under attack. Insurant activity steadily increased through the end of March 2004, culminating on the murder of four Blackwater civilian contractors whose mutilated bodies were hung from a bridge. Marines were dispatched to Fallujah on 3 April 2004. 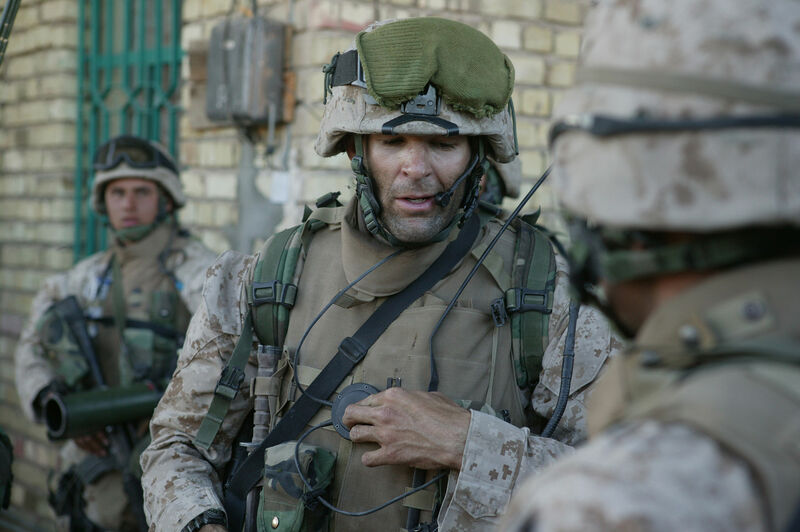 Then captain Zembiec and Echo Company was assigned to the Jolan District of Fallujah. His Marines were situated on a rooftop and they were taking fire from AK-47 semi-automatic rifles and rocket propelled grenades. The Marines severally attempted to radio for support from an Abrams tank (below them) to fire on the enemy position, but they were unable to make contact. Suddenly, Zembiec leaped up and rand down the stairs, out into the street under a hail of enemy gunfire. From the rooftop above, Gunnery Sergeant Pedro Marrufo observed the captain leap upon the tank and was able to get the tank commander’s attention from inside. While under intense enemy fire, Zembiec directed the tank fire into the enemy position. Leading from the front is how Zembiec’s men remembered him. In May 2007, Zembiec was serving with the CIA Special Activities Division in Iraq. He was leading a force of Iraqi soldiers, who he had helped train, and they were carrying out a raid in the dark of night. Moving into an alley, Zembiec saw something, or heard something, or sensed something … he quickly warned his troops to “get down.” And then a shot rang out from the darkness, and Doug Zembiec fell, mortally wounded. A firefight ensued, and when it was over, a radio report went out, “five wounded, one martyr.” Leading from the front —the hallmark of a true American hero; in keeping with his own advice: be valorous on the field of battle. Major Zembiec believed in something bigger than himself; it is how he lived his life; it is how he died. May God bless and keep him.